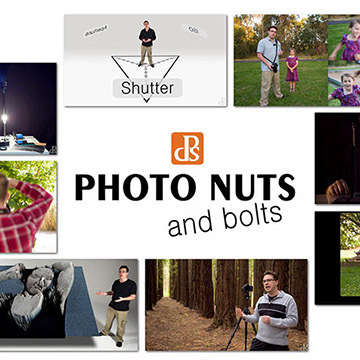 These photo composition tips are good for posed studio photography and also apply to more natural settings with busier backgrounds. 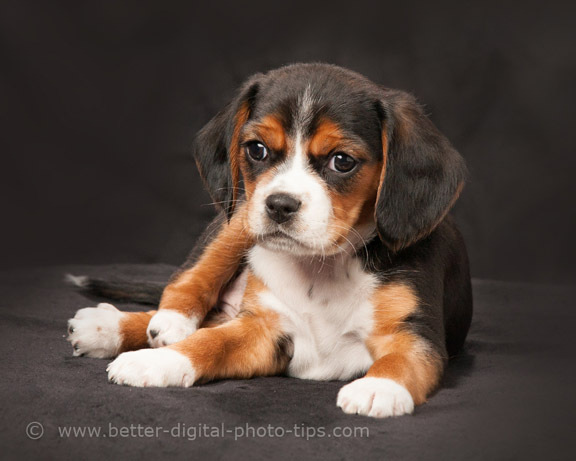 Pictures of your adorable puppy will come out okay, even with bad technique, but let's explore a few tips for better pet photography. If you fine tune your composition techniques and use the right photography lighting and equipment your photos will really make you smile. It's likely the most common mistake you've made when it comes to photographing your pet, getting a bad background. Let's face. 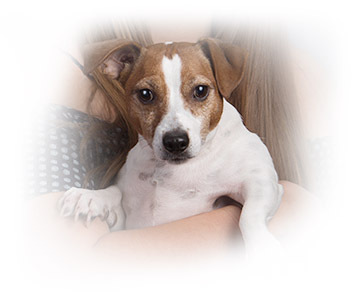 We love our pets and we liket photograph them naturally as they play. Sometimes it's challenging to get them in the right spot. I'm not suggesting that you should only photograph them when they're sitting perfectly still in the perfect location. I am suggesting that you pay attention to the background. 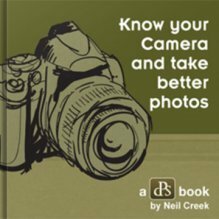 You can have it as a thought in your brain as you shoot that you do have control over the positioning of the camera and sometimes the location of your pet. Check out the composition below. Meet my Grand Puppy, Quinn. Quinn is a cutie pie for sure, but I could have done a better job in handling the background in this photo composition. She was the typical energetic puppy who didn't sit still for very long. If I had used a wide open aperture (the largest f/stop number) the background would have been out of focus and less distracting. 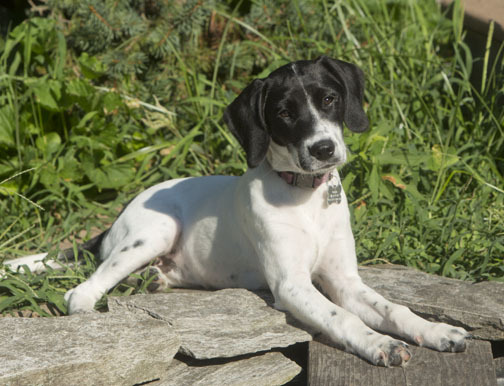 Try to create a shallow depth of field in your photo compositions of your pet. I chose black as my first background choice in the photo below. I knew I was going to be photographing the beaglier and her colors were going to be brown, black and white and I wanted my background to be neutral and compliment my subject. I backed up my camera and zoomed in to a telephoto setting of 105mm. 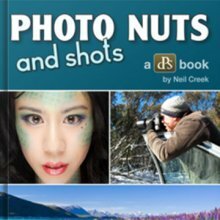 The telephoto setting is typically a good setting to get a pleasing perspective for portrait photography of people as well as pets. Compare the photo above with the photo below. It is also good to experiment with more dramatic perspective changes. In the photo below, my camera lens was zoomed to to widest-angle setting. I was only a few inches away from my subject so the composition is dramatically different. 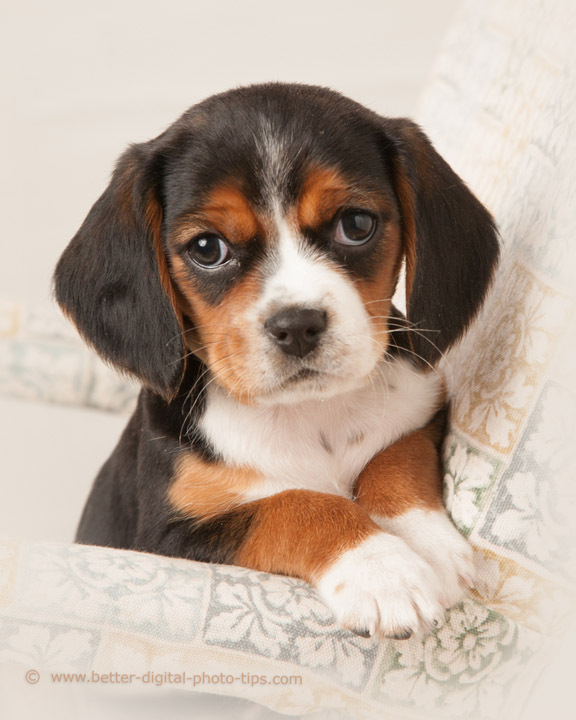 The puppy's head appears disproportionately large in size compared to her body is certainly a more comical look. I almost never do this with portrait photography of people but it is a fun technique to use with a puppy and emphasizes her cute nose and droopy ears. Her head is so close to the camera compared to the distance from her body to the camera that it dominates the photo's composition. Wide-angle lens settings tend to exaggerate perspective. Telephoto setting "flatten" the image and diminish perspective. In the photo of "Elvis" below, I got directly above him and rotated my camera to create a diagonal composition. 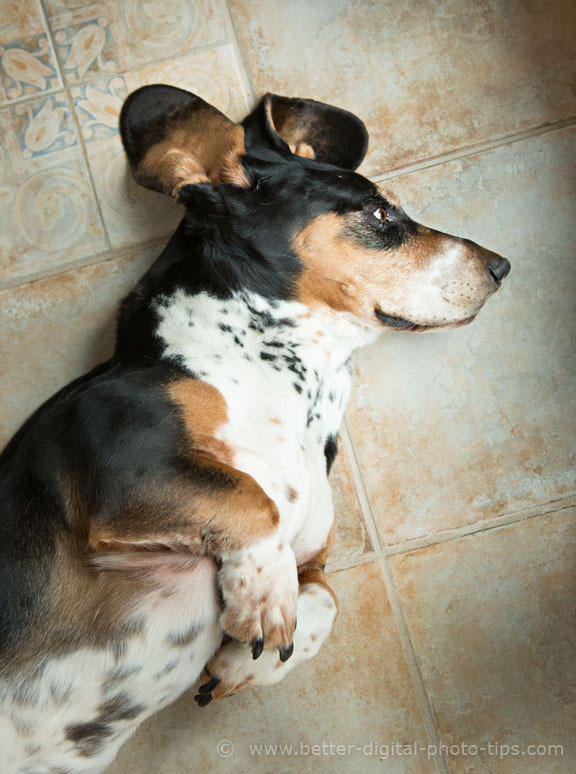 Two of the unique features of Basset Hounds are their large ears and their short legs. Elvis laid down on his side very close to a large window, giving me great lighting and natural shadowing on the right side of the photograph. He graciously allowed me to adjust his left ear which I folded back under because it had been an an awkward angle. The position of his head at the intersection of the 4 floor tiles was just lucky. I didn't even notice it when I was taking the photo. Another tip that I've touched on, in more detail in another article involves using a framing device within your photo's composition. This can be challenging, but it really works great when the opportunity arises. 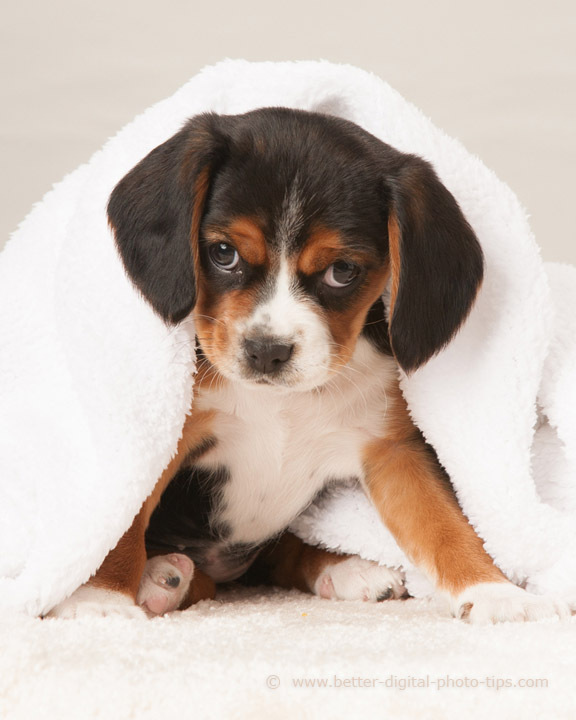 In the photo below, the blanket frames the puppy's face and also eliminates the horizon between the posing table and the background. She lowered her chin and tilted her head for just a second and I was able to get this absolutely adorable pose. Here's a more indepth article with tips on how to use framing in your photo. In the composition below I used a chair as a support prop. The chair had a light colored upholstery to start with and I toned it to be even more neutral in Photoshop. Tightly cropped from the original to eliminate distractions. This is one of my favorite compositions because of the position of her paws and the expression on her face. One of the photo composition tips you'll hear frequently is to plan your colors. The pose below involves the introduction of a contrasting color which can work in your favor. Generally you want colors to match, but it's definitely subjective. I like this brightly colored ball as a prop, but personal preferences and opinions will vary. 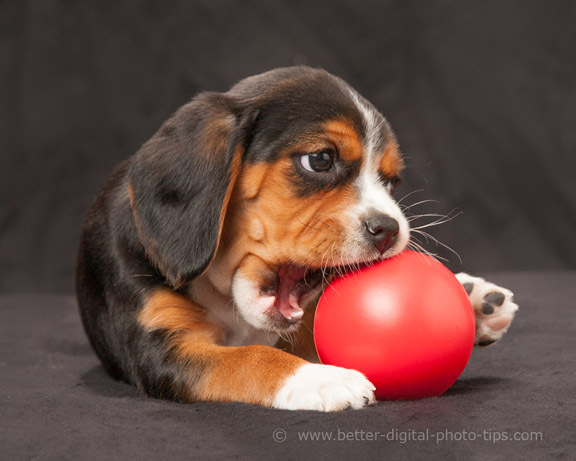 The ball is in close and is a good puppy prop. Try some with all complimentary colors and try some with alternative colors and judge it for yourself. The key is to be aware that colors are an important element in every single photograph you take. I think the inclusion of the red ball adds a story to the photograph. It's a simple geometric shape and it is a single color so it does not become distracting. 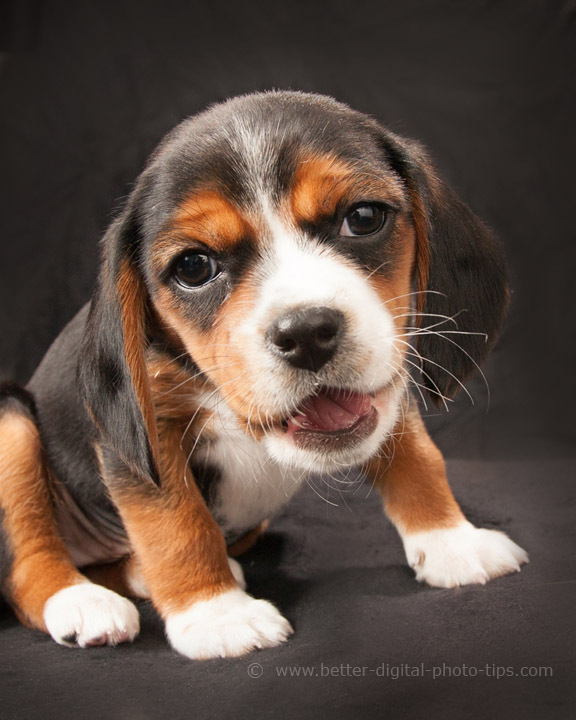 It makes sense for a puppy to be playing with such a prop and her playful expression and jaw position are just right. The photo below is not as successful. There is a story behind it though, that is important to the dog's owner. 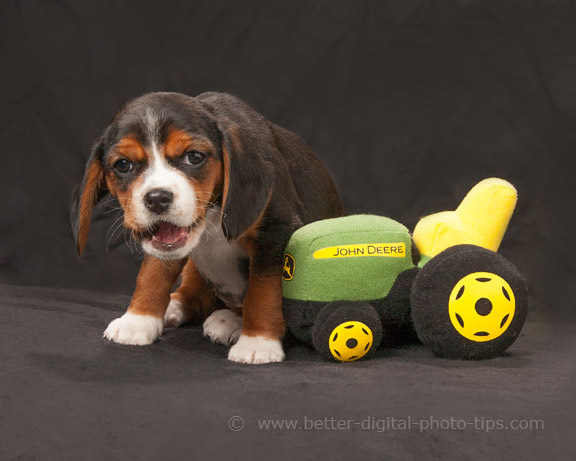 This puppy was originally born into a farming community and her new owner wanted her photographed with the tractor as a connection to her heritage. It is still a cute idea with a cute puppy. If this were submitted in a photography competition, the judges would say the tractor is a distraction and it is not positioned properly in the composition. More importantly to my client, the prop has a special meaning to the owner of the dog and is a photograph she will enjoy for years. The eyes are the windows to the soul. It's no different than photographing people. Your subject's eyes are the most important thing in the photograph, above all else. Make sure you focus specifically on the eyes so that they are tack sharp. There's nothing worse than a portrait of a pet or a person where their eyes are out of focus. Over 60% of United States of America homes have at least one pet. 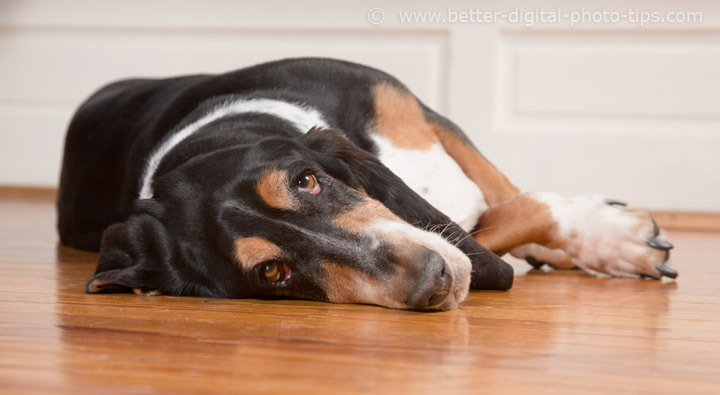 Pet photography is a popular activity for these owners, but unfortunately it's easy to make photography mistakes relating to composition and lighting very easily. If you pause, even just for a second to observe the lighting and think about the composition, you are already ahead of at least half of your fellow snapshot takers. Shoot more photos. Watch less TV.